This post is sponsored by North Country Smokehouse. All thought and opinions are, as always, 100% my own. 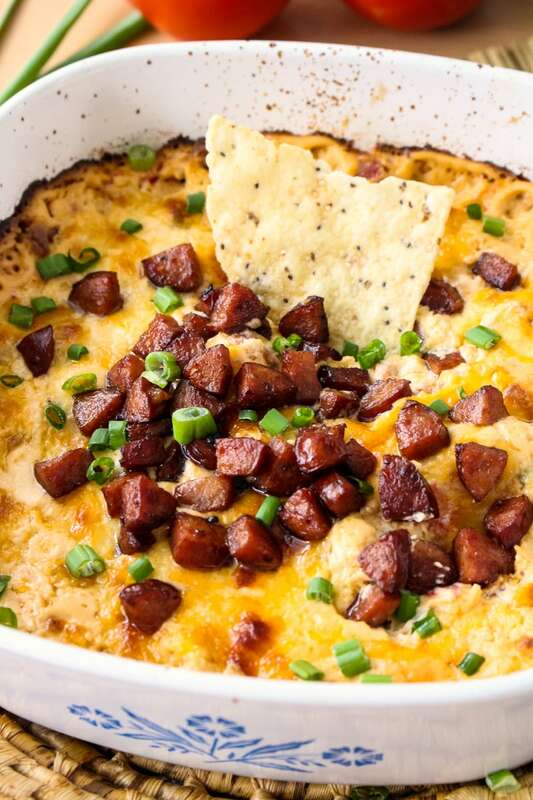 Cheesy Baked Andouille Dip is not your average sausage dip. It is creamy, super cheesy, easy to make, and full of bold Cajun flavor that will knock your socks off! It’s that time. Time to break out the big guns. Nothing mundane allowed. Everything has led up to this pinnacle of all pinnacles. Are you ready, friends? You know you are! Okay, y’all...it’s time for the Super Bowl! That’s right! Now that the big day is upon us, it’s time break free from your usual party food ideas and take your Super Bowl menu to the next level with food that is worthy of such an occasion. Like I said, nothing mundane allowed when it comes to the big game. You want your food to be right on par with the level of excitement you feel on the big day! Well, I have good news for you. I have come up with an amazingly delicious recipe for you to munch on while you’re sitting on the edge of your seat waiting to see who will win. 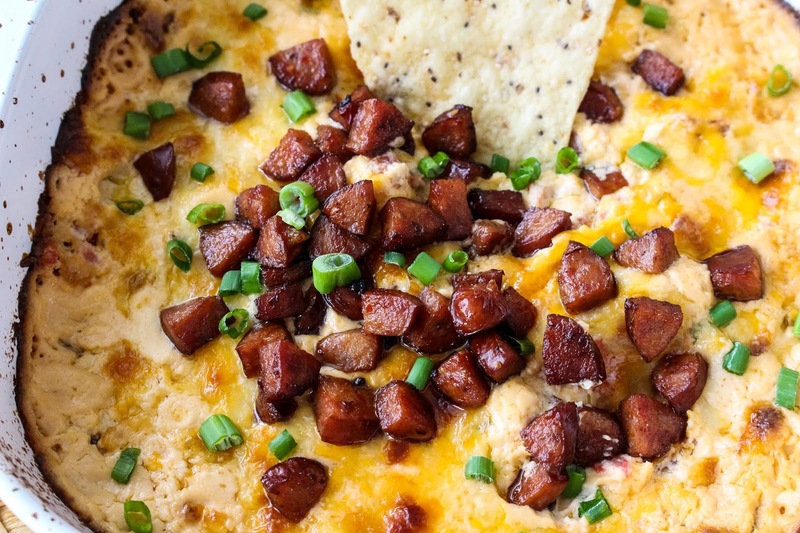 I made this rich, cheesy, delectable dip that is sure to be a touchdown on game day. 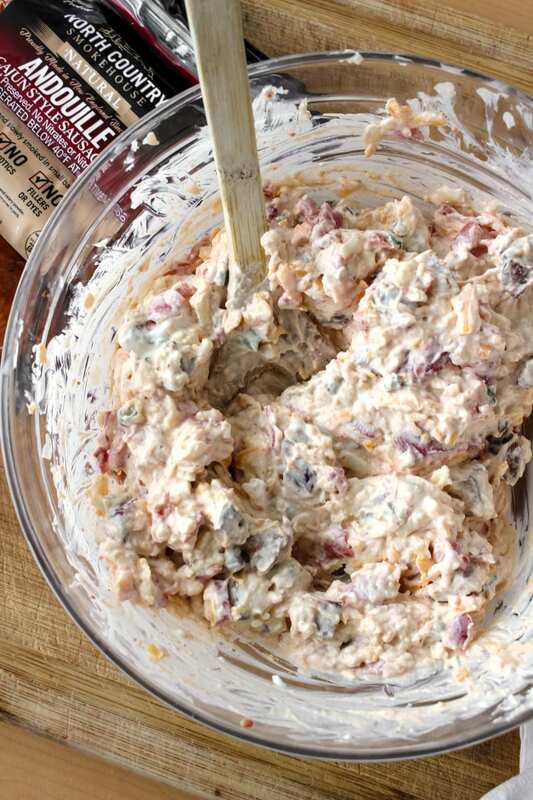 This sausage dip features bold, spicy, irresistible Cajun Andouille Sausage from my friends at North Country Smokehouse. If you haven’t tried this sausage yet, you must! The folks at North Country Smokehouse know what’s up when it comes to smoked meats. North Country Smokehouse is a third generation family business located in the gorgeous New England countryside that focuses on hand-crafting artisanal, sustainable, small-batch products that have exceptional flavor. But, that’s not all. The good folks at North Country Smokehouse pride themselves on crafting meats from humanely raised livestock that is treated with respect. From breed selection to vegetarian feed, antibiotic free practices, and non-GMO farming, the meats produced at the smokehouse are Certified humane and rated USDA Organic. If that doesn’t make North Country Smokehouse worthy of your Super Bowl party, I don’t know what does! Now, let me tell you a little more about this tasty cheese dip. I started with a basic cream cheese dip that I loaded with mozzarella and sharp cheddar cheese. I threw in some tomatoes to balance the spicy andouille and some green onions for a little pop of color. A little sour cream and mayo helps to give this dip recipe it’s creamy texture. 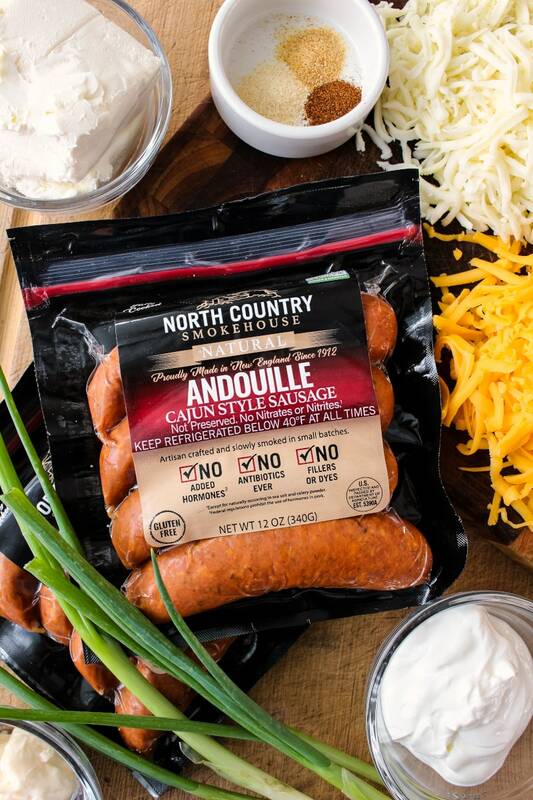 Finally, that bold, Cajun, amazing North Country Smokehouse Andouille Sausage is added to the mix and is the star of the show! I sauteed the sausage before adding it to the dip to give it that yummy caramelization that I adore. Then, it’s all mixed together, spread into a dish, and baked in the oven until it’s golden, bubbly, and out-of-this-world good. This is the Super Bowl appetizer that your party needs! Head on over to Whole Foods, Hannaford Supermarkets, Stop & Shop or Big Y to pick up the best artisanal meats I have yet to try. You can use the North Country Smokehouse Store Locator to find a retailer in your area and you can also shop the North Country Smokehouse virtual store on their website. I can’t wait to try their Applewood Smoked Polish Kielbasa, Smoky Maple Sausage, and Whiskey Fennel Sausage. They all sound ah-mazing! So, are you ready to plan a Super Bowl menu that, I daresay, will outshine the game itself? Go for it! 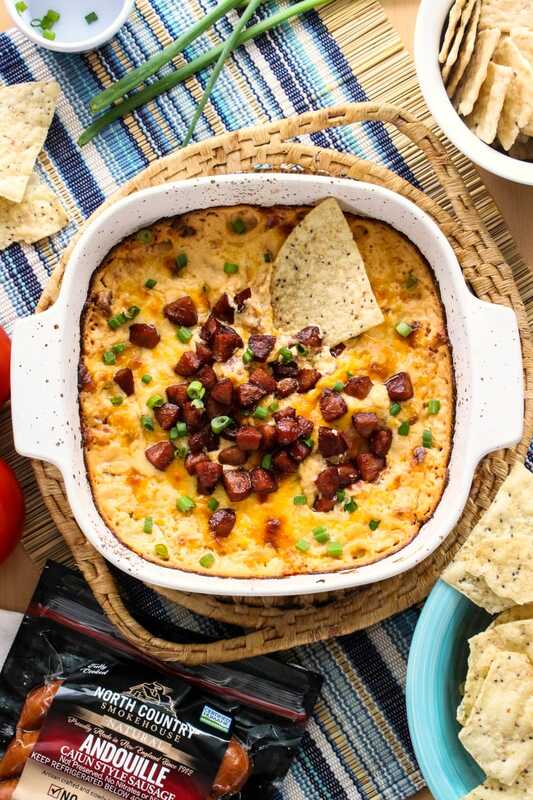 If you try this Cheesy Baked Andouille Dip, I’d love to know what you think in the comments below. Enjoy! 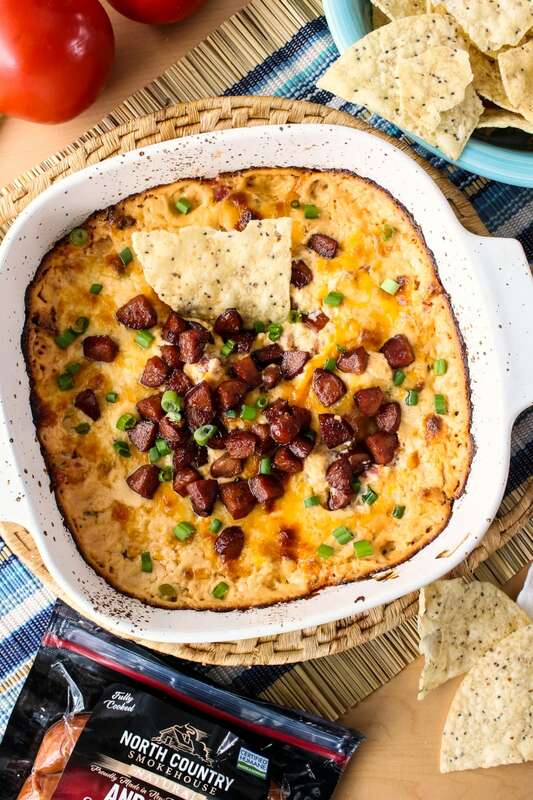 Cheesy Baked Andouille Dip is not your average sausage dip. It is creamy, super cheesy, easy to make, and full of bold Cajun flavor! 3. 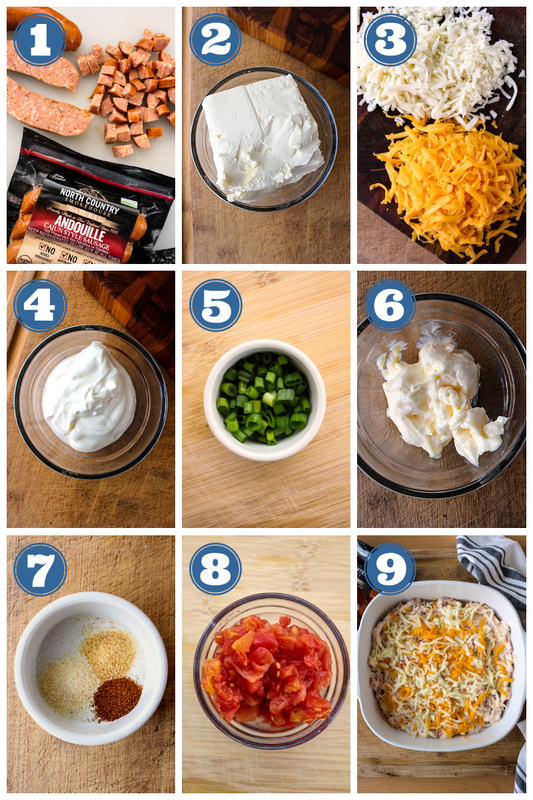 Combine the softened cream cheese, sour cream, mayo, 3/4 cup shredded cheddar cheese, 3/4 cup shredded mozzarella cheese, diced tomatoes, half of the green onions, and 3/4 of the Andouille Sausage in a large bowl. 4. Spread the dip into a baking dish and top with the remaining shredded cheddar and mozzarella cheese. 5. Bake for 30 minutes or until hot and bubbly. Garnish with the remaining Andouille Sausage and green onions. Let sit 5 minutes before serving. Serve with tortilla chips for dipping. Be sure to drain as much grease as possible from the sausage before adding it to your cheese mixture. Pushing a paper towel around the pan to soak up the grease works very well. Be sure to thoroughly drain the tomatoes of as much liquid as possible. This dip is best eaten fresh out of the oven. When reheated, the sausage releases additional grease and the dip separates. Oh my gosh - HEAVEN!! !